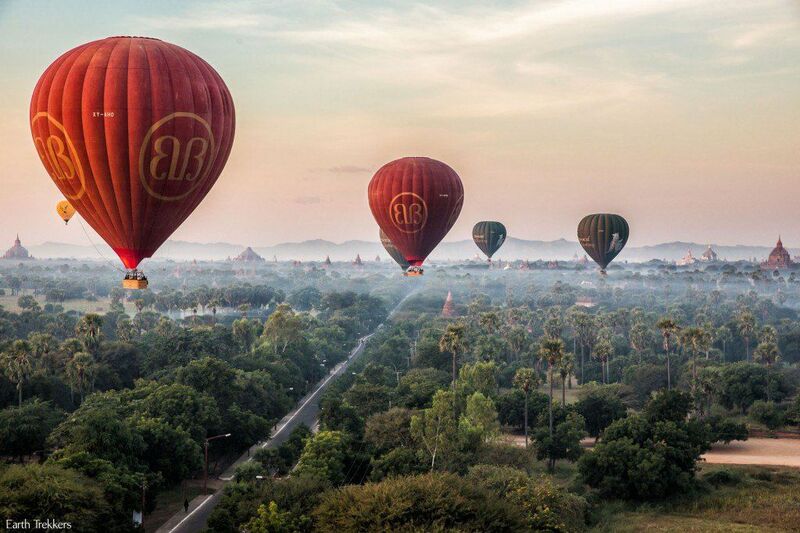 Yangon, once known as Rangoon, is the largest city in Myanmar. 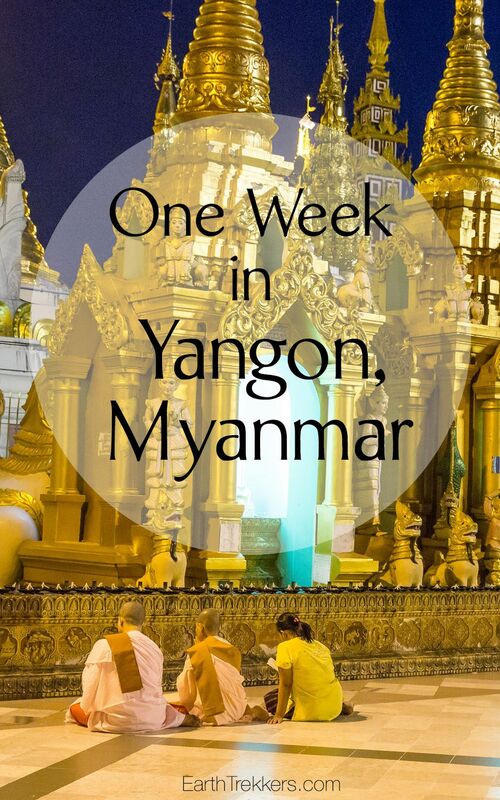 This city was our introduction to Burmese culture, and we had seven full days to spend here. Most people tour through Yangon in two or three days but we needed the extra time to get our Thailand visas. Having the extra time here was awesome…it was great to go a week without packing and unpacking, and we had plenty of downtime to relax and get to know this city. Myanmar, once known as Burma, is a country where democracy is just beginning to take hold, government corruption is very high, and religious conflicts and clashes are frequent. 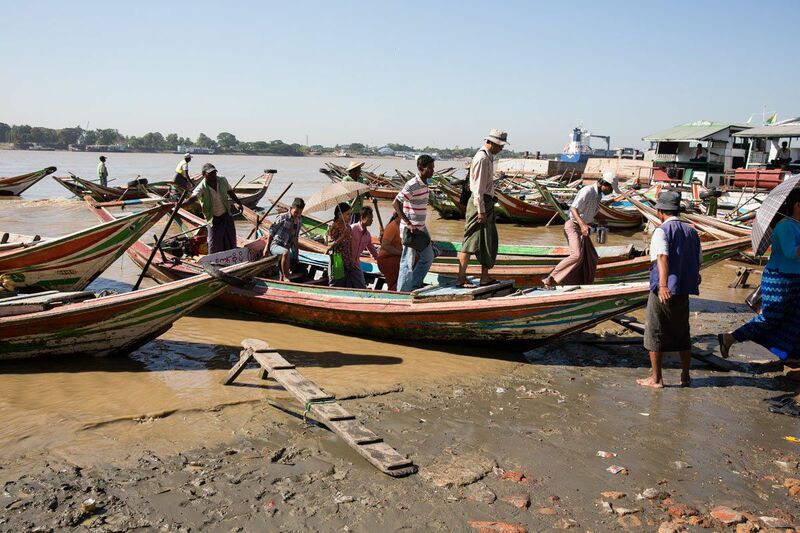 Myanmar is the poorest country in Southeast Asia, with many people getting by on as little as $2 per day. As foreign investors move in, Myanmar’s government and military are “relocating” people off of their resource rich lands. This also leads to more clashes between the people and the government. We saw many groups of people protesting in Yangon, people who had been forcibly moved off of lands they had lived on their entire lives. 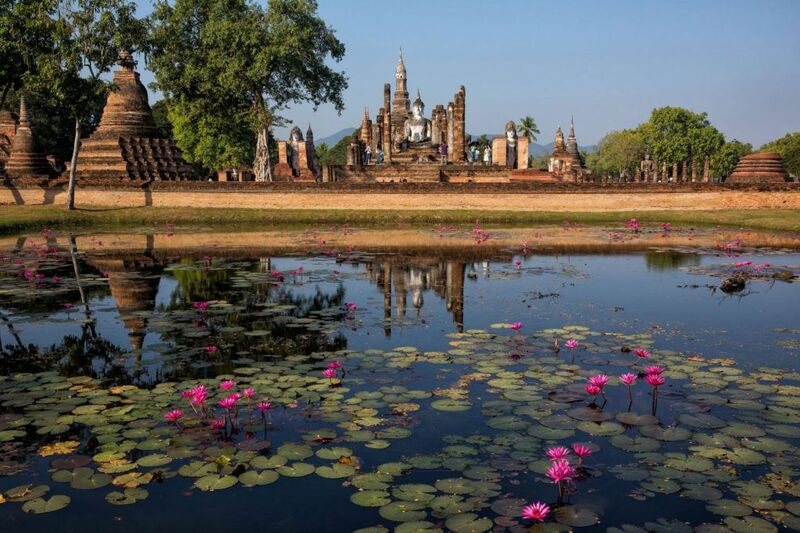 Tourism in Myanmar is a relatively new thing. 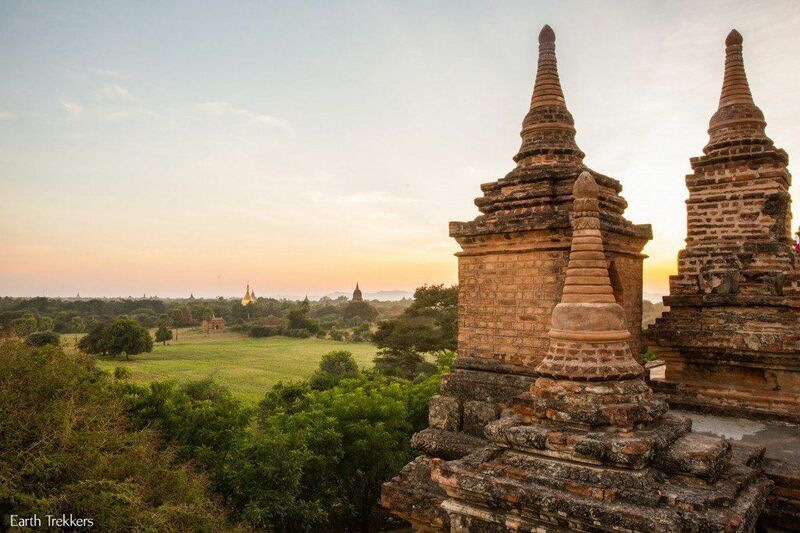 For almost fifty years Myanmar isolated itself from the rest of the world, and it wasn’t until the last decade that tourism began to take hold. 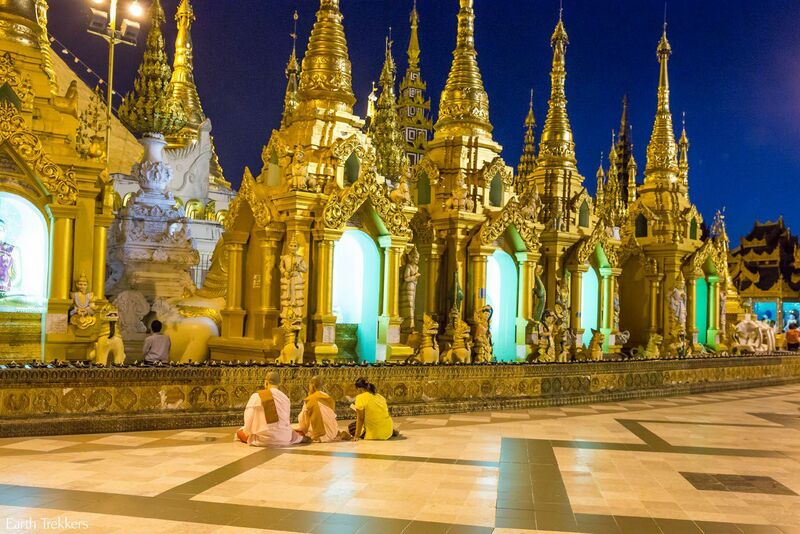 This country is rapidly changing, as Myanmar moves towards democracy and foreign investors move in. This is a country to be visited now, before it becomes a hotbed of tourism and Starbucks and McDonalds move in. 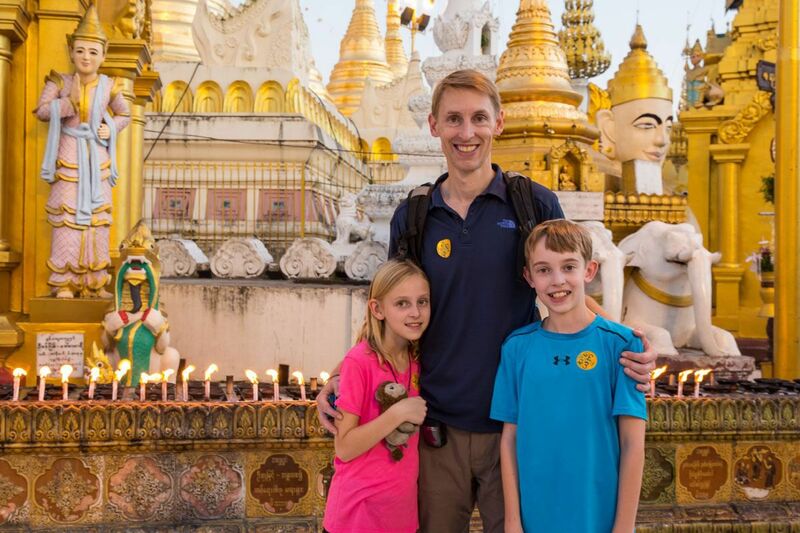 We visited Myanmar in November and December 2015. 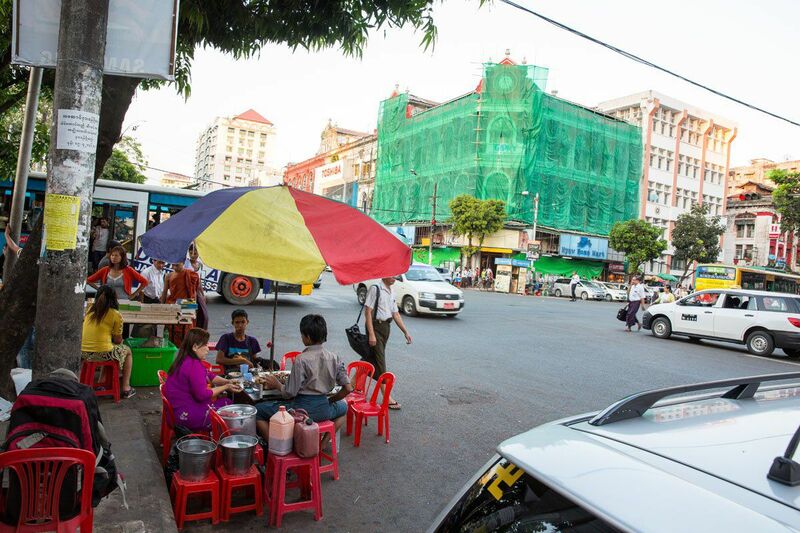 For a country that spent decades living under a military dictatorship, we were surprised at how nice Yangon was. 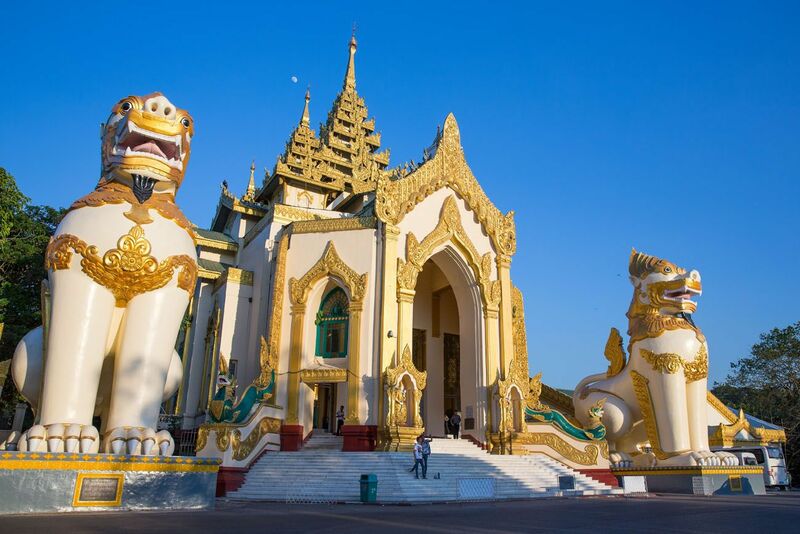 Yangon is a relatively large city, a mix of old, crumbling British colonial buildings and much newer, modern buildings. There is new construction everywhere, as funds from foreign countries pour in. 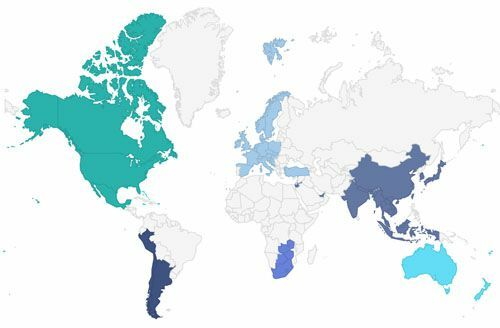 The people here, the younger generations in particular, are embracing Western cultures. The people here love the United States and would comment on how rich and powerful and wonderful our country is. 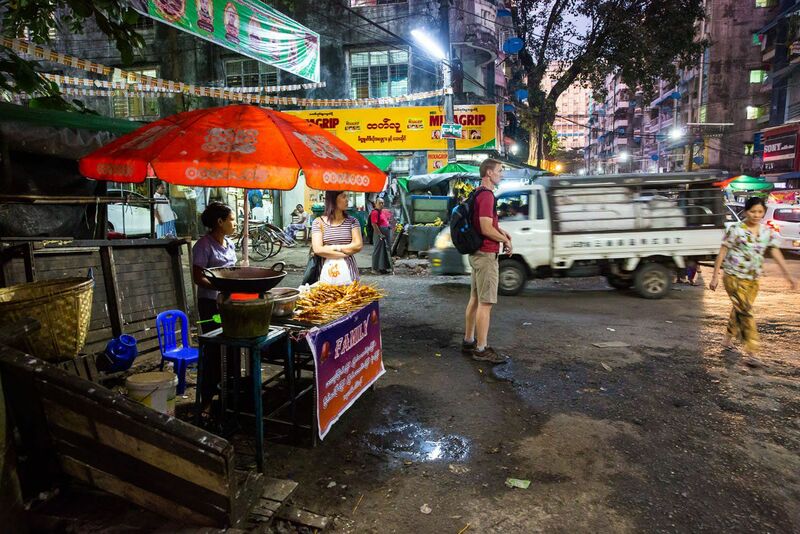 During our first few days in Yangon, we did not do much. Getting our Thai visas was relatively easy and it was nice getting that out of the way. We did try a lot of new restaurants and foods. 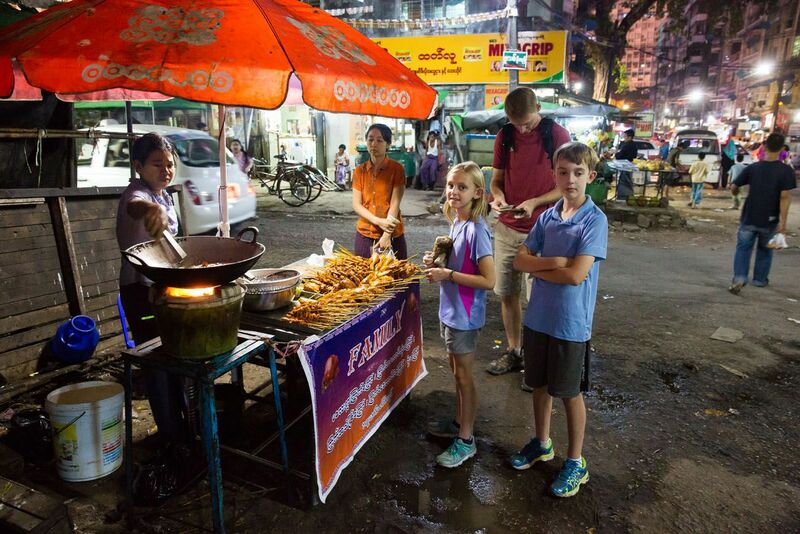 Noodles, rice, soups, and curries are the main things people eat here. The food was fantastic and cheap, costing us an average of $2 to $3 per dish. 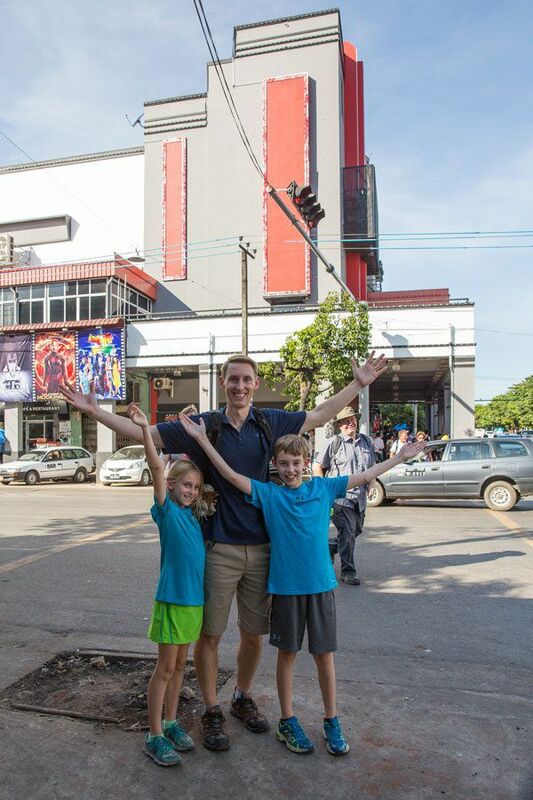 One of the highlights for Tyler and Kara was watching the movie “Mockingjay Part I,” a movie in the “Hunger Games” trilogy, at the Mingalar San Pya Cineplex in downtown Yangon. In order to buy our tickets we were shown an electronic diagram of the available seating and then chose our desired seats. Choosing seats is not first-come, first-serve like in the US. We purchased our popcorn and Kit Kats and sodas, and took our seats in the theater. The movie was sold out. First we were shown very interesting, and somewhat cheesy commercials in Burmese, and then movie previews for some western films as well as Asian films (some in English, some in Chinese with English subtitles). The best part of the experience was standing as the Myanmar flag was shown on the movie screen and the national anthem was played on the speakers. The movie was shown in English with no subtitles. Throughout the movie we heard many people crunching on popcorn and some kind of seeds. This was a great cultural experience for our family, not to mention a very fun activity for our kids. This visit to the movies cost our family of four a total of $13. 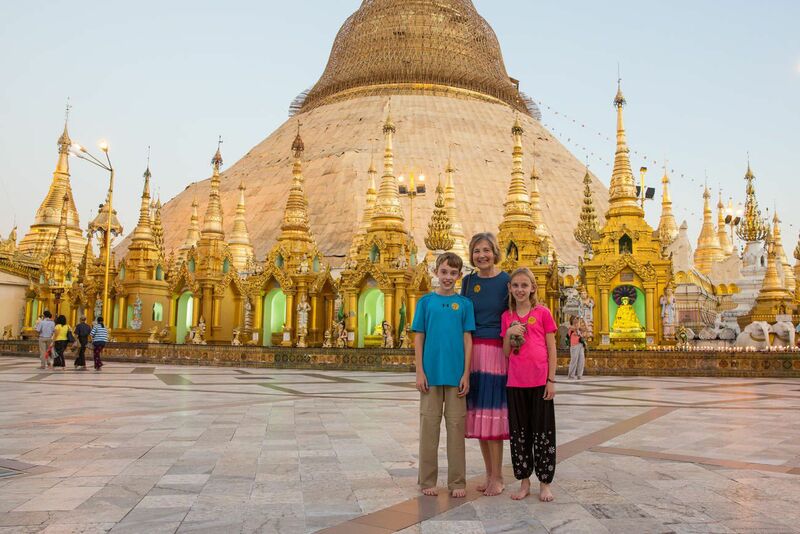 At our midpoint in Yangon, my mother, Kathy, joined us. She flew twenty-four hours, from Dulles to Abu Dhabi, UAE to Bangkok, Thailand to Yangon, Myanmar. It was a very long haul for her, but all of her flights were on time and her luggage made it as well. At 10 am on a Tuesday morning we were reunited. Of course, we were all thrilled to have her with us. When traveling for so long it is wonderful to see a familiar face. Mom also brought some familiar food…homemade chocolate chip cookies…which were delicious and gobbled up immediately! 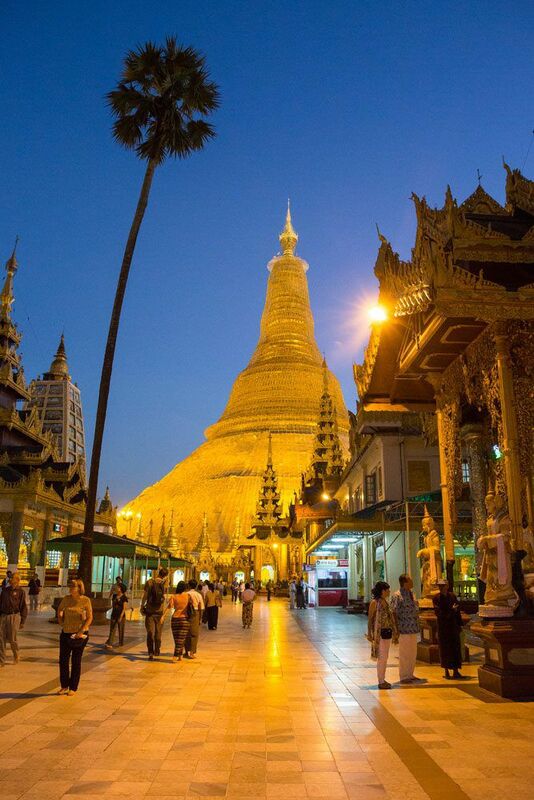 Yangon’s iconic site is the Shwedagon Pagoda. 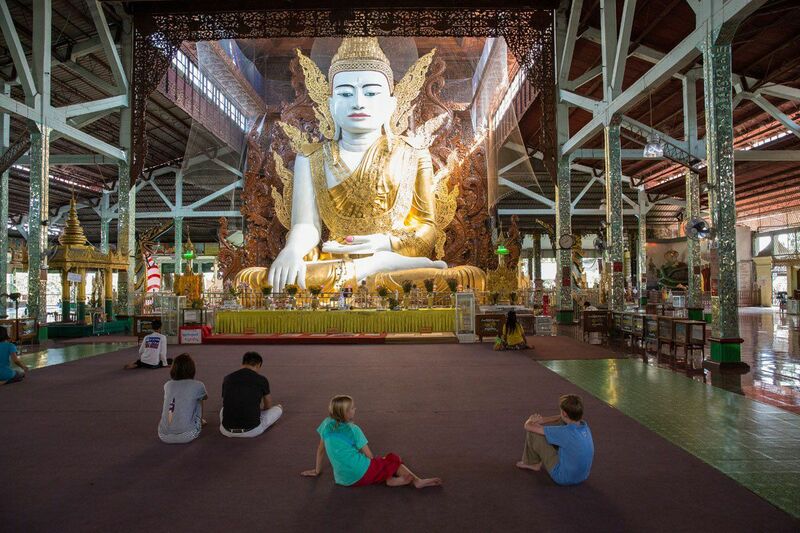 This place of Buddhist worship is a spectacular site. A gigantic, golden stupa is surrounded by smaller houses of worship. 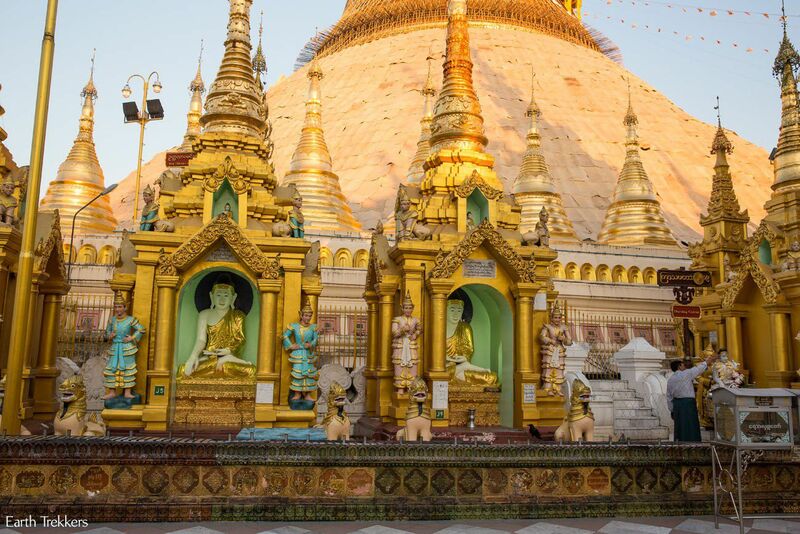 The gleaming stupa can be seen from all over Yangon. Unfortunately, it was covered in scaffolding during our visit. We are not having great luck with the scaffolding this year, as another famous building, the Colosseum in Rome, was also covered in scaffolding. Shwedagon was still beautiful, even with the scaffolding, but it would have been awesome to have seen it in all of its golden glory. 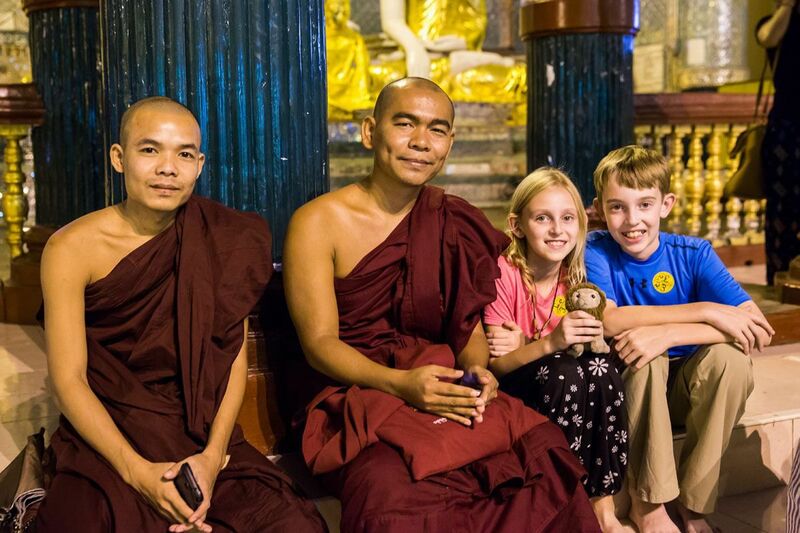 While visiting the Shwedagon Pagoda, we walked among other tourists, but also many local people who had come to pray. This was a fantastic introduction into Buddhism for Mom, who got to see her first Buddhist monks and her first stupa. 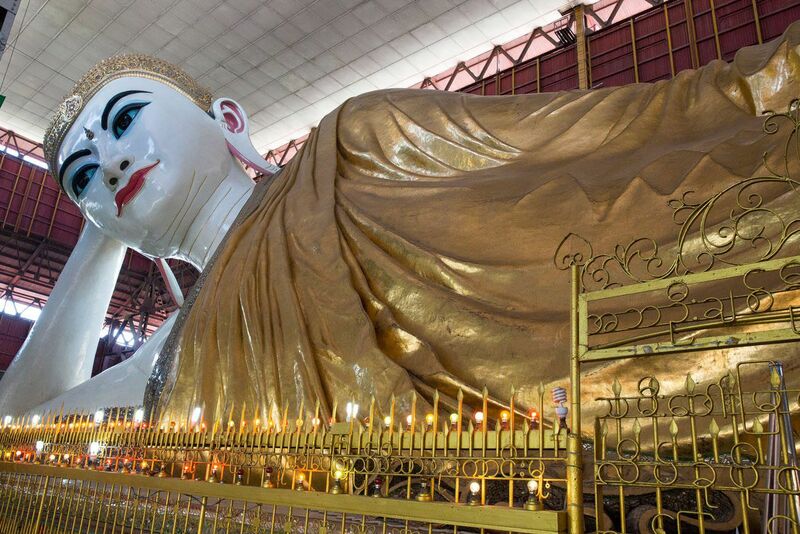 The Shwedagon Pagaoda is almost overwhelming in its beauty, with numerous small shrines, ornately decorated buildings, larger rooms filled with golden Buddhas, and of course, the enormous golden stupa centerpiece. Tim and I loved the Buddhas with the technicolor, LED halos. What a modern addition to an ancient relic. 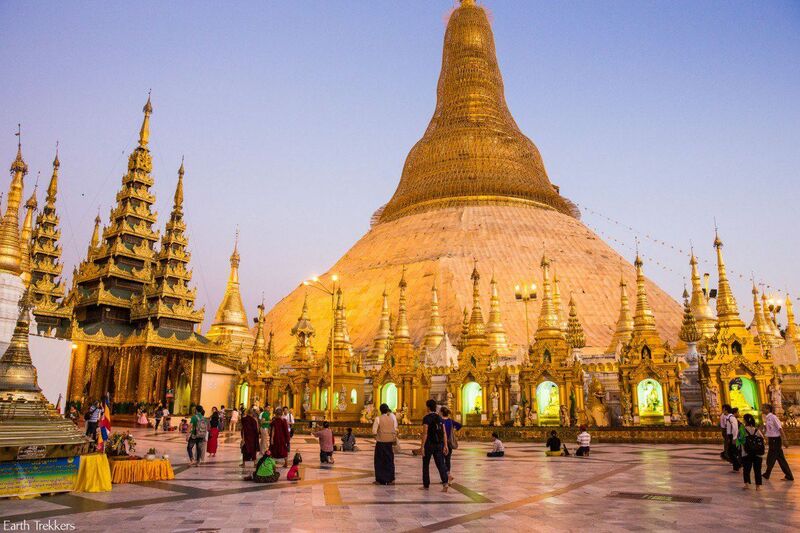 We visited the Shwedagon Pagoda at sunset, one of the best times of the day to be here. The temperatures were cooler (it gets into the low 90’s here during the daytime, even in December) and the lighting was magnificent. 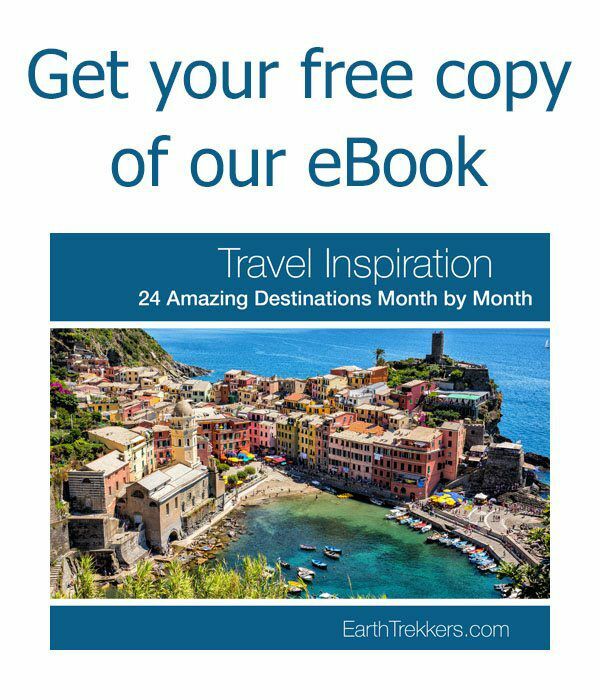 If you have been following this blog then you know how much I love to get those postcard pictures! 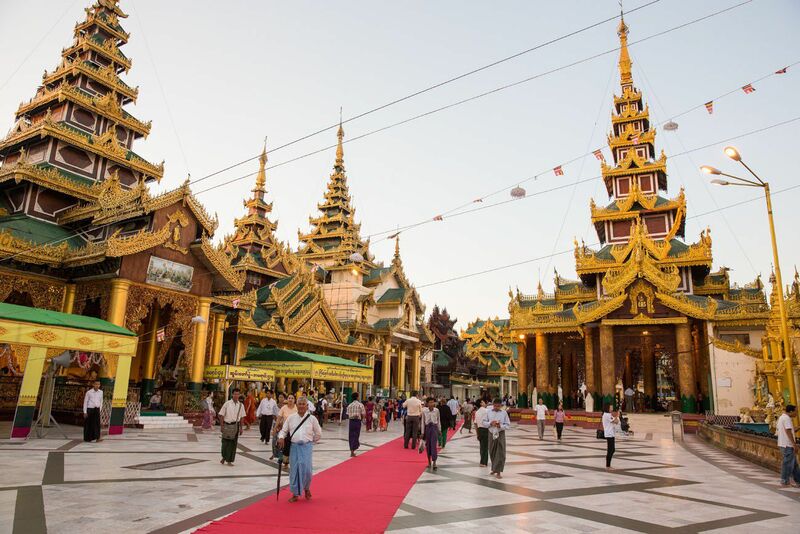 The Shwedagon Pagoda was our favorite thing we saw while in visiting Yangon, but this city still has a lot more to offer. For $50 we hired a driver to take us around the city for the day. 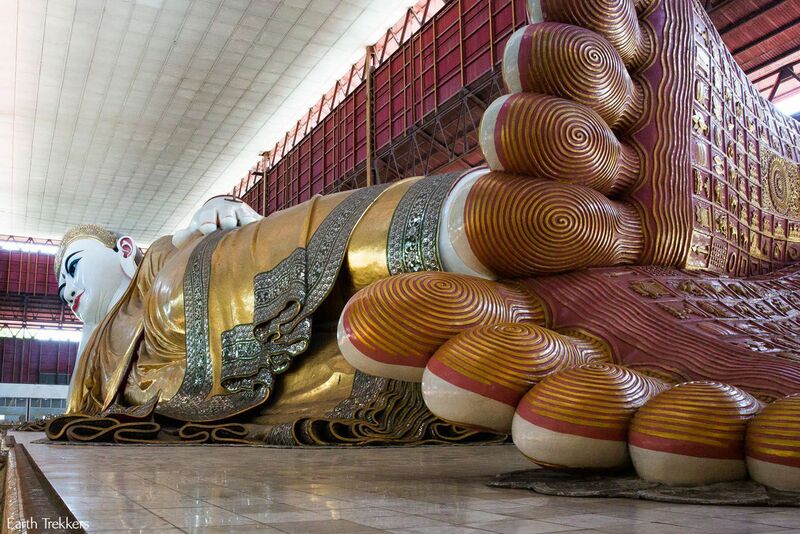 We saw two giant Buddhas, one reclining at the Chaukhtatgyi Paya and the Sitting Buddha at the Ngahtatgyi Paya. To visit these sites we had to remove our shoes and socks. 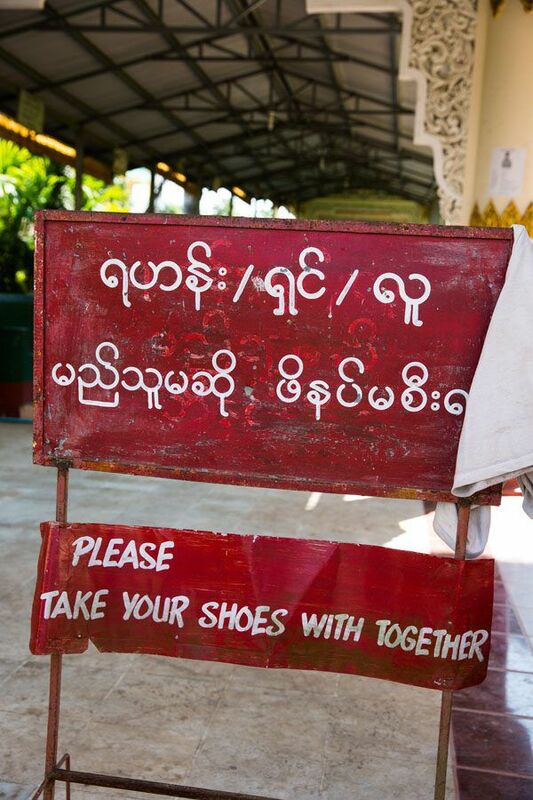 Everyone we saw in Yangon wore flip flops…taxi drivers, shopkeepers, our hotel staff, children, adults…everyone. To enter some shops we also had to remove our shoes and stops. It didn’t take long for us to break down and buy some flip flops as well. 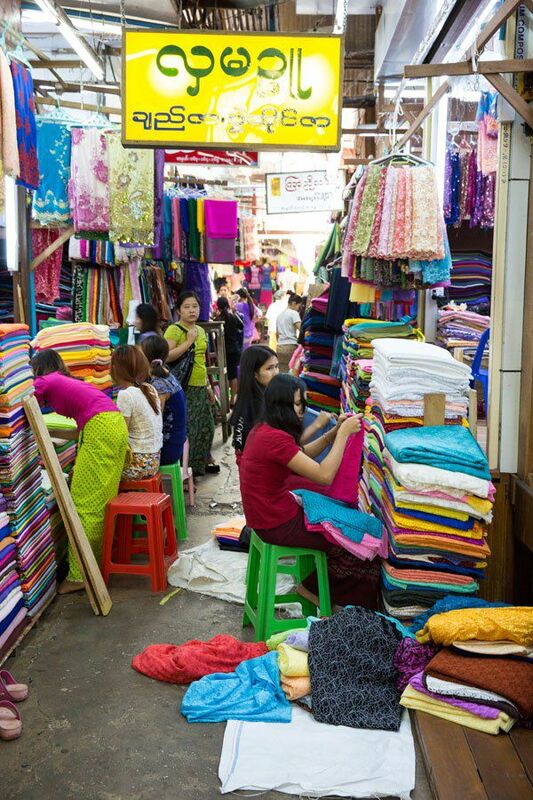 One of the best places for shopping in Yangon is at the Bogyoke Aung San Market. 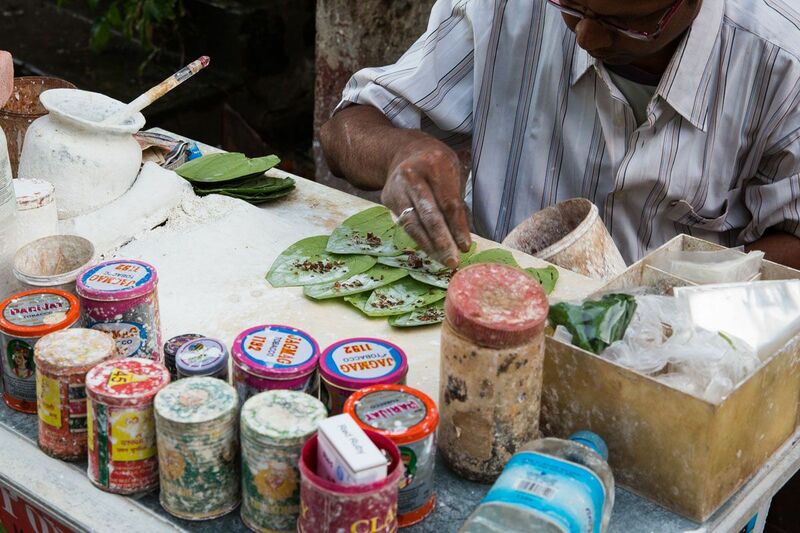 This market, which is a series of warehouse buildings connected together by outdoor alleyways, is the place to buy those very important flip flops, clothing, handmade artwork, and jewelry. We bought our flip flops here, and Kara and I also purchased longyis. A longyi is a traditional skirt worn by Burmese women. It is one piece of fabric that is wrapped around the waist and tied on the side. It is long, ending at the ankles, and made of a variety of fabrics and prints. We picked out the perfect dark pink fabric with embroidered flowers and 20 minutes and later Kara and I each had a longyi. Another famous site in Yangon is the Karaweik Palace. This place looks very interesting from the outside. This is the place to go for dinner and to watch a cultural dance. 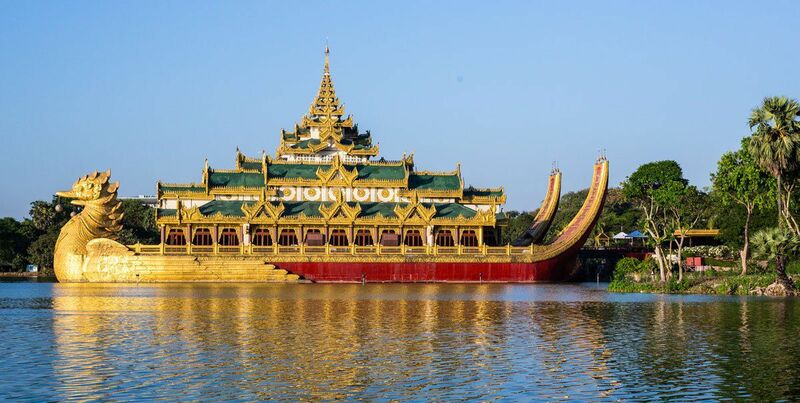 We thought a boat ride on the Yangon River would be a great way to see the city. One morning we took a taxi down to the riverfront, walked passed a small local market selling fruits and vegetables, and walked out towards the river’s edge. We watched as people climbed out of small motorboats and made their way into the downtown area, on their way to work. These were the boats we wanted to take for our ride, not the giant touristic ferry. Tim asked several boatmen to take us but he got the same response from each them, “police.” Apparently, these boats were for the local people only and not authorized for tourist use. So, instead of a ride on the Yangon River, we spent the morning relaxing in the very posh Strand Hotel, drinking coffee and eating fabulous french toast. 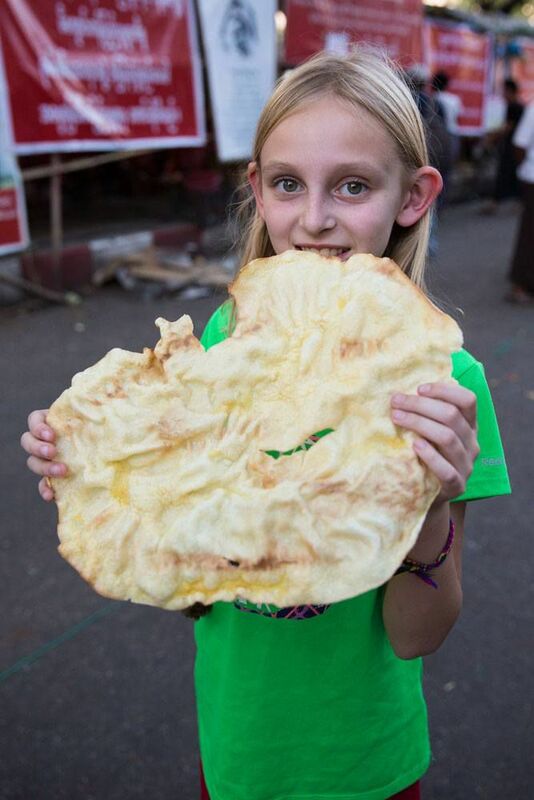 We really liked Yangon. We liked seeing the mix of the old and the new buildings, meeting the very friendly people here, and using our Indian haggling skills when purchasing postcards and souvenirs. The food was cheap and delicious and very healthy. It was great having Mom with us again, being her tour guide, and taking her around the city. Yangon is a city we would like to come back to someday, and I think it will be a much different place just ten years from now. 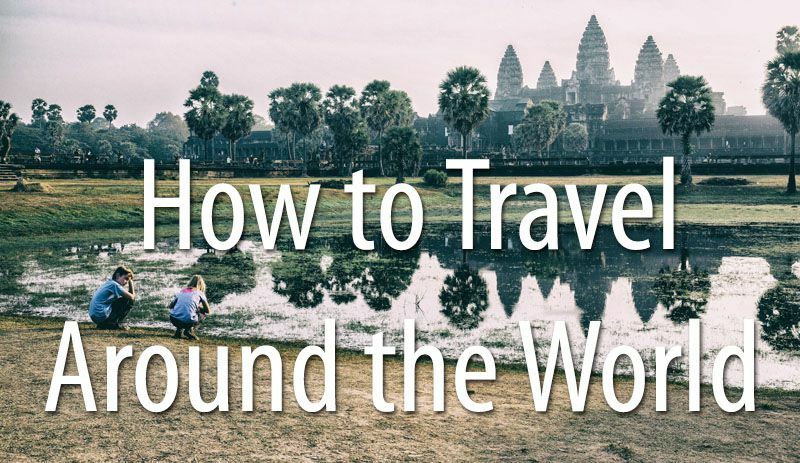 If anyone reading this has been considering traveling to Myanmar, come now, before it changes too much! 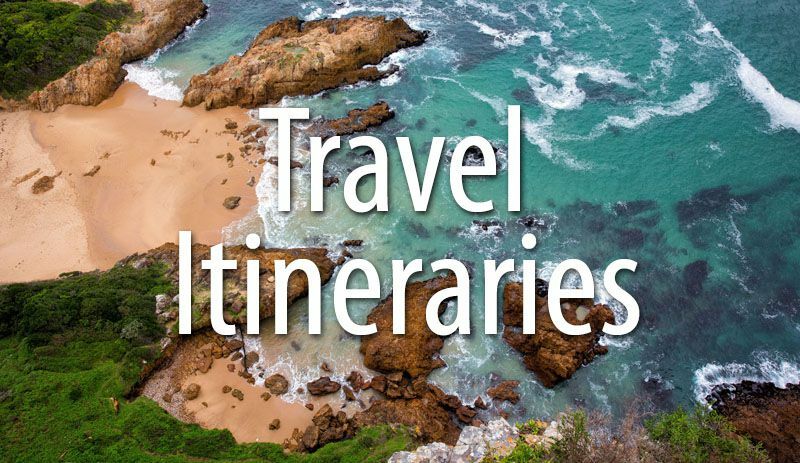 I am going to read your blogs as you have been to quite a few places that my husband and I are going to go to in 2016. We are currently booking places. We unfortunately only have 3 mths as I will have to return to work. What?? No pictures in the longyis? I was so disappointed. But I am behind in my reading. Maybe they will surface yet. Kara and Tyler seem to have grown a foot since you started this journey. When you make it to Thailand I would love to meet up with you. Ether in Bangkok or Ayutthaya. I live exactly half way between both places. Would be fun to meet you guys in person and here some of your stories and also to take you around. In Ayutthaya I can take you to the “ElephantStay” where they have two newborn elephant babies currently…much fun. I appreciate the offer. We are in Bangkok now. 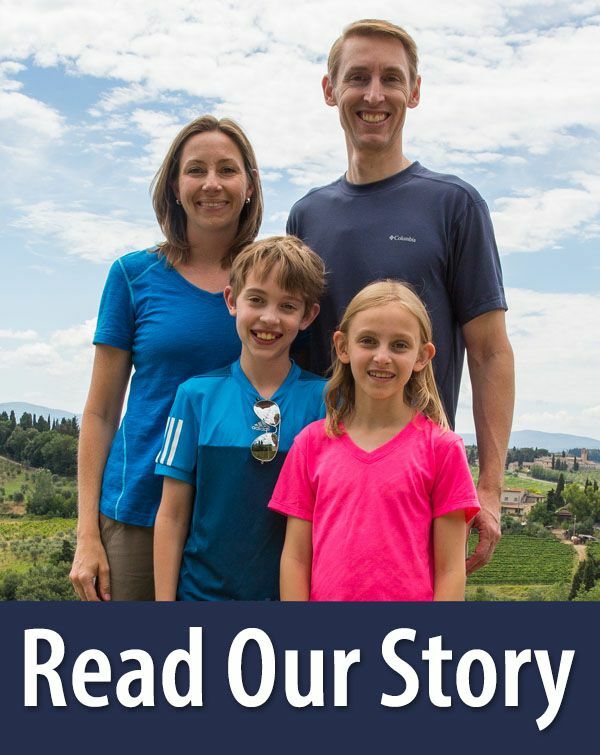 Our time here is complicated…we are arranging Visas to other countries, arranging doctors appointments for a minor medical issue which has come up, and we have family visiting us for this short period of time. We will not be able to meet this time around but hope you continue to follow our journey. If I can be of help or a source of information pls do not hesitate to contact me by email. Yes. I purchased at the Charleston market, with you! Thanks for writing!! I made it here!! It’s nice to have built in tour guides, traveling with Julie and Tim. Yangon is unique and like nowhere else I’ve been. Looking forward to what lies ahead! What a fabulous trip! And your writing makes it like I am right there with you. If only….I really love your pictures. Must be a great camera. Can’t wait to see where you are spending Christmas. Surprise, surprise…won’t be much longer now! Tyler and Kara are very excited and have been talking about our Christmas destination for two months now. 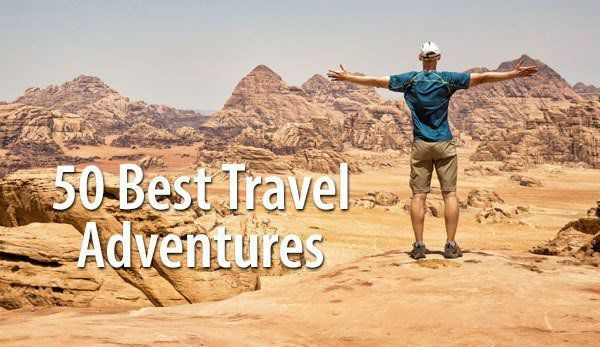 I’ve been following you since the beginning of your adventurous trip. I’ve also been praying for your safety and your health. 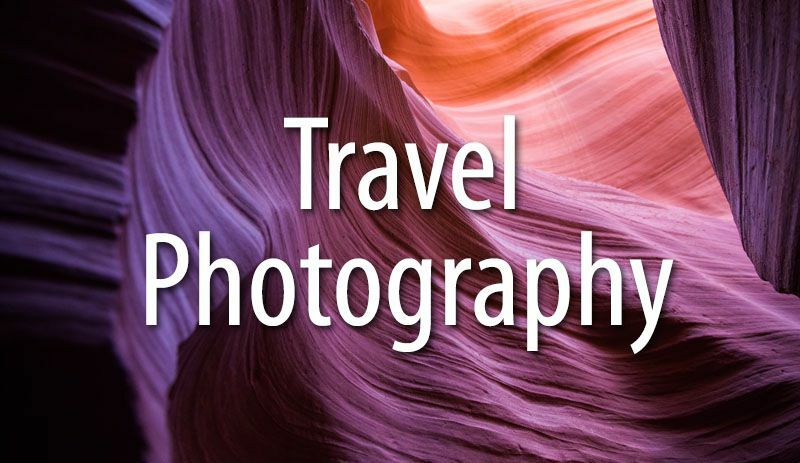 Your photographs have been beautiful. Thanks so much for sharing this with us. Hey Kathy, I recognize that skirt! Have fun! Great pictures, my wife and I enjoy reading your posts and following your progress. What a treat to have your Mom join you guys, I bet the kids were thrilled. Carry on and be safe, be well! I love your blog. What an amazing trip! I am from Baltimore.